Based on the innovative P3 phantom power technology, the Plush P3 Power Supply™ is a self-contained DC power supply, which provides 9-VDC of regulated and filtered DC power to up to 1500 ma (1.5 amps) of pedals. The patented P3 Power technology: http://www.dcvoltage.net is designed to power a pedal board without batteries or extra cables, and operates the pedals via a single audio/power cable. P3 completely does away with the need for batteries, battery cables, "wall-warts," extension cords or power strips. We think it's one of life's "must-have" inventions for guitarists. P3 is available as an upgrade for most pedals, and there's also an external power kit available for use with unmodified pedals. P3 is fully backwards compatible: It will work with and even remotely power non-P3 pedals. P3 does not alter audio circuitry or harm the tone in any way and may in fact improve sound quality and performance as it eliminates battery voltage droop along with the batteries. Several pedal makers and service centers are authorized to perform P3 upgrades to existing pedals, and P3 is being included in some guitar amplifiers. As universally useful and beneficial as P3 is, we expect it will become a standard, becoming to guitar pedals what phantom power is to mixers and microphones. The P3 power supply has a standard IEC style power connector, and automatically switches from 100/120 to 220/240 volt AC lines. The P3 Power Supply features two outputs: the P-32 phantom output, as well as a traditional (Boss style) connector, which allows P3 and non-P3 equipped pedals to coexist on a pedal board. 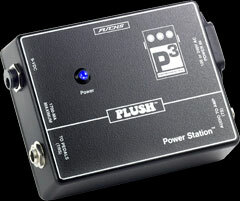 Patch cables or the P3 Power Splitter can be used to feed multiple P3 and non-P3 pedals from the power supply outputs. The power supply is self-protected against over current and output shorts, automatically turning off under fault conditions. An ultra-bright LED power indicator is provided, which can been seen in direct sunlight. Like all Plush pedals, the P3 Power Supply is made in the USA in a solid cast aluminum powder-coated enclosure, with heat treated silk screening. The power supply includes a 5-year warranty.